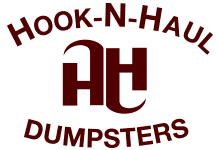 With Hook-N-Haul Dumpsters, you will not have to worry about hidden surcharges or extra fees such as delivery charges, fuel surcharges, tipping fees and environmental fees. Thank you for choosing Hook-N-Haul Dumpsters. Austin's choice for reliable and affordable dumpster rental. If your in need of a dumpster rental delivery to your home or work place then fill out our dumpster rental request form to schedule a Dumpster Drop Off or Dumpster Delivery. If received before noon, dumpster drop-off requests can be scheduled for the following day. All drop-offs will occur during normal business hours (7a-dark), Monday-Friday. Rent will begin the day after delivery. So, request delivery the day before you need the dumpster to ensure it will be ready for the start of your project. Rental periods can be extended for an additional fee of $10 per day. Also be sure to read our dumpster rental terms and conditions to make sure that you are well aware of the different prohibited items, when renting a dumpster.